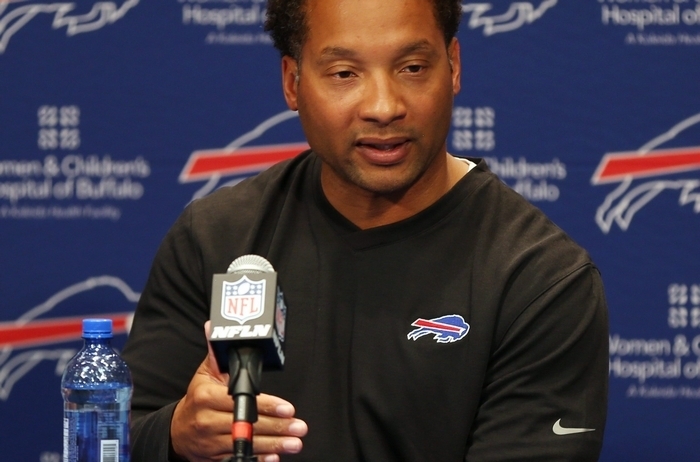 Doug Whaley is blunt about the state of the Buffalo Bills’ quarterback position. “The way we looked at it is, we don’t have a proven franchise quarterback, that’s obvious,” the general manager said Monday during the team’s annual pre-draft media luncheon. Given the need, then, wouldn’t it make sense for the Bills to invest the first pick they have in the draft, 50th overall, in a quarterback? Even with the presumptive top two quarterbacks – Florida State’s Jameis Winston and Oregon’s Marcus Mariota – long gone by the time the Bills make their selection in the second round, shouldn’t they strongly consider one of the other players at the position such as Baylor’s Bryce Petty or Colorado State’s Garrett Grayson or someone else? By most accounts, there is no clear-cut, third-ranked quarterback in the draft. Many analysts believe that there is a significant drop-off at the position after Winston and Mariota. Whaley, however, is on record as disagreeing with that premise. And while he won’t offer any indication of what sort of grades the Bills have on any of the quarterbacks – or any players, period – in the draft, he does say there’s logic to considering taking one each year. One method Whaley said was unlikely for the Bills to acquire a quarterback, or any player for that matter, was to trade into the first round. The Bills gave up this year’s first- and fourth-round picks in trade with the Cleveland Browns last year to move up five spots to select wide receiver Sammy Watkins. For now, they have six picks: one in the second, one in the third, one in the fifth, two in the sixth, and one in the seventh. That doesn’t give the Bills much, if anything, to utilize to acquire a first-round pick. The Bills don’t necessarily feel tremendous pressure to address quarterback this year because their offseason acquisitions were mainly devoted to working around their lack of a franchise player behind center in EJ Manuel, Matt Cassel, Tyrod Taylor, and Jeff Tuel. That was the thinking behind trading for running back LeSean McCoy and signing wide receiver Percy Harvin and tight end Charles Clay. The NFL schedule will be announced Tuesday at 8 p.m. on NFL Network and ESPN. The only date known so far for a Bills game is their Oct. 25 encounter with the Jacksonville Jaguars at London’s Wembley Stadium. Kickoff is at 9:30 a.m. ET. Media analysts have been debating almost daily about which of this year’s draft quarterback crop is more ready for the NFL. The discussion has focused mainly on Winston and Mariota, but with several quarterbacks having played in spread-style offenses in college that put the quarterback in shotgun formation rather than dropping back and working heavily from the pocket, there has been a greater focus on how well they perform in pre-draft workouts.